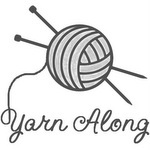 I always enjoy the weekly Yarn Along, hosted by Ginny of Small Things, but I never seem to get my act together in time to put one up. Today I finally remembered! Not that my knitting is that exciting, more on the practical side. However, I’ve been dragging it around to the beach, swim lessons, the kiddie pool, and baseball practice. That means it needs to be able to take a little sand and chlorine, and yes dirt. And despite their practical nature, I’m really in love with this stack of dishcloths I’ve piled up the last few weeks. 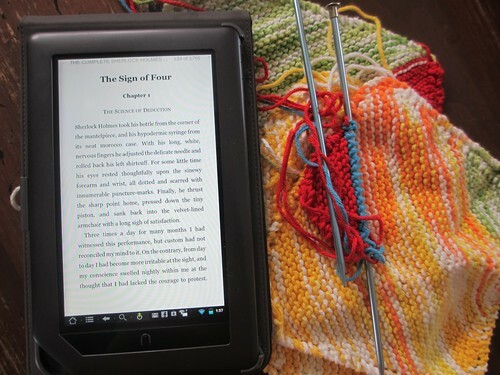 The book, if you can see it on my Nook, is The Sign of Four, but Sir Arthur Conan Doyle. I’ve always been a Masterpiece Mystery fan, and the latest Sherlock Holmes series has been fabulous. So I decided to dive in and read the actual stories and downloaded the entire works of Conan Doyle, all 1755 pages of them! I’m not sure I’ll read them all at once, I have a few other books in mind as well. But they make an very entertaining summer read! Okay, he does not look psychotic nor is he drinking horchata, but we love this song and I think of it every time one of the boys puts his balaclava on. Spinner’s is the latest in our collection, although it looks like I need to knit one more since someone (ahem, Knittykid) lost his. So, Spinner’s many faces in his balaclava? Enjoy your weekend everyone! Listen to a fun song, knit a balaclava and head outside!